In today’s challenging business environment, customer contact centers are looking for ways to transform themselves from being cost centers to profit centers on their way to becoming strategic value centers, adding value to the whole enterprise. In a 2003 Aberdeen Group survey of customer service executives, 83% of the participants said that their contact center is critical or important to their enterprise. 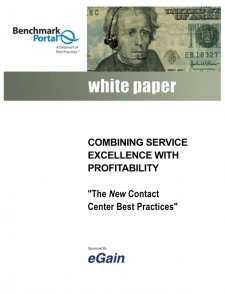 In 2004, Purdue University’s Center for Customer-Driven Quality surveyed C-level executives and found that in addition to their usual focus on cost reduction and revenue generation for call centers, their new demands included caller satisfaction, increased wallet share and increased market share.